MAD HORSE HITS THE PRESS! Join us for our 2018-19 Season Reveal! April 19, 2018 | 6:00-8:00 p.m.
Miss the crackling fake fires, V-neck sweaters and improbable snow-covered guests of the 60’s TV holiday variety specials? Join us as we give a distinctly Mad Horse treatment to an all-singing, all-dancing night of retro holiday cheer! Live Auction, hors d’oeuvres, beer & wine cash bar... and a wild & wacky mystery for you to solve! All proceeds go to support your favorite theatre company! Join us for our 2017-18 Season Reveal! April 20, 2017 | 6:00-8:00 p.m.
two of the hottest shows from PortFringe ’16! In 1979, frustrated with the lack of “serious” roles being offered him, Paul Lynde abruptly quit Hollywood Squares while his personal life spiraled out of control. Zany Hijinx presents an intimate peek at the beloved ‘Center Square’ and ponders what brought him to this point…and what could redeem him? Best known for his quick-witted comebacks on Hollywood Squares and as Uncle Arthur from Bewitched, Paul was his own biggest critic and was never satisfied with his career or personal life. A MURDER MYSTERY FUNDRAISING EVENING AT MAD HORSE! Our 3rd Annual night of murder, mayhem, and many laughs! All to support your favorite theatre company! The evening included hors d'oeuvres, a beer & wine cash bar, live auction, plus a good, old-fashioned who-dunnit! The series has consistently brought exciting, original scripts by Maine playwrights to theatre audiences in the Greater Portland area. Many plays originated at BY LOCAL have gone on to full productions--including this season's main stage production, DIGBY'S HOME, by Company member Brent Askari. Monica Wood's PAPERMAKER, produced at Portland Stage Company, and Callie Kimball's ALLIGATOR ROAD, produced by Mad Horse last season, were both first presented at BY LOCAL. THE BALLAD OF DAPHNIS AND CHLOE is very loosely based on the Greek myth Daphnis and Chloe. In this retelling, the young Daphnis and Chloe -- both spending each day with each other tending sheep and talking of plain things-- become plagued with some unknown illness that causes stirrings, fevers, and bulges. They believe they will perish from the apparent illness and seek counsel from the wise and not-so-wise. They discover a story with each other that is comic, dangerous, poetic, and thickly sensual. EM AND WEB takes a look at two people who, in spite of loving each other, have quite a bit of baggage and face obstacles in their romantic relationship. The play demonstrates how real relationships not only take work, but can also prove amazing in the simplest of moments. Megan E. Tripaldi is an actress, playwright, and educator in the greater Portland area. She graduated from the University of Southern Maine with a BA in Theatre in 2012, and has been working in education programs since with Portland Stage Company, Stages Performing Academy, and the Children’s Museum and Theatre of Maine. She has had her plays produced in Maine, Massachusetts, West Virginia, and Washington State. She has most recently been seen in several productions by Naked Shakespeare, Pie Man Theatre Company, Bare Portland Theatre, and Portland Stage Company. Each staged reading is followed by an audience talk back session with the playwright. DYING TO KNOW is a comic exploration of our struggles to come to terms with death. It is the story of a relationship between a woman who is a hospice patient and the somewhat hapless hospice volunteer whom she befriends. In Butler’s play, a death-obsessed woman confronts her biggest fears in a relationship that changes her life. LASCAUX is set in September of 1940. In a wood in the South of France, two boys and one dog go in search of some innocent fun. What they discover on their journey is more than mere child’s play – much, much more. O’Leary’s tale shows us that art can lead you to some dark places. David E. Butler has lived and worked in Maine for two decades. His play THE GRAND O’NEILL has seen several productions here in Maine and will open later this year in Cincinnati. Another play, THE TERMINAL BAR, will be performed next summer at the Deertrees Theatre in Harrison, Maine. An autobiographical play, THE HIGH PRIEST OF INFINITY, was produced at the Boston Center for the Arts. Butler is an actor who has worked in Boston and with numerous local theaters, and he is also a Congregational minister. Kevin O’Leary is a founding member of WritersGroup: New York City. His play, THE FAIR, was produced by Ellipsis Productions this past June as part of PortFringe 2015 on the main stage of Portland Stage Company. Last May, his one-man play, SOLILOQUY, was produced by Axial Theater Company of New York as part of its 2014 “Life on Earth” series. O'Leary has written nearly a dozen full-length plays, many short works, as well as plays for younger audiences. His new play, THE ROLES OF A LIFETIME, is a fictional account of a day in the life of Condell and Heminge. AUGUST 22 & 23 - A staged reading of a new musical with lyrics by Sarah Safford, book by John Reynolds, and music by Rob DelGaudio, Tanya Leah, Natalie Lovejoy, and Jonathan Monro. This groundbreaking musical offers an honest, heartfelt and surprisingly witty glimpse into a chemotherapy session/support group run by volunteer and cancer survivor extraordinaire, Marjean Macgraw. With music, humor and pathos, the play tells the story of three very different people affected by cancer, and by each other. Each of the two readings will be followed by a discussion with the artists. Club Meds has been workshopped in NYC and on Martha's Vineyard. The reading at Mad Horse is another step in the play's development into a fully-fledged production, and Mad Horse is thrilled to be a part of the process. “Almost everyone has been affected by cancer in one way or another but most of us have trouble talking about these painful experiences. Our hope for Club Meds is to reach people through humor and song, to let feelings surface, to let laughter and tears flow, and to open paths of communication about a topic we usually avoid,” states Sarah Safford. "When we reflect on how many peoples' lives have been touched by the battle against cancer, and how we as a culture are finally recognising that we can share, talk, and even, yes, laugh about that struggle openly, it seems surprising that a musical of this nature has not already been explored." states Mad Horse Artistic Director Christine Louise Marshall. "This is really amazing, wonderful, important new material. We're very excited to be taking part in its development." Mad Horse Theatre Company is extremely proud of our BY LOCAL new play reading series, which premiered during our 2013-14 season. 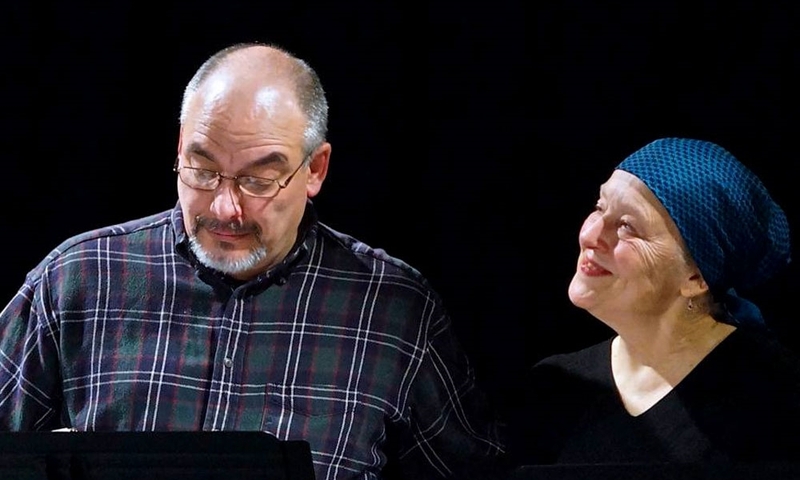 BY LOCAL gives Maine playwrights the opportunity to present their original full-length plays in front of Mad Horse’s audience. Each selected play is read twice over the course of a single weekend. A discussion follows each reading, which gives the playwright a chance to make changes based on audience feedback, then test their newly-edited work. Plays from the 2013-2014 season included Pudding by Michael Tooher, Getting Daddy's Gak by Payne Ratner, Papermaker by Monica Wood, and Alligator Road by Callie Kimball. BY LOCAL for the 2014-2015 season included Digby’s Home by Brent Askari, Humpin’ Glory Bay by Karmo Sanders, From Away by MK Wolfe and Discipline by Gerard Bianc. Mad Horse was proud to present the runaway hit of PortFringe 2014! Written and directed by Tim Ferrell, this play is funny, fast and furious. Part courtroom drama, part fever dream, the play is loosely based on the actual obscenity trial that took place on January 12, 1965, when “A Book Named Naked Lunch by William S. Burroughs” found itself the defendant in Boston Superior Court on charges of obscenity. Witnesses appearing in defense of ‘Naked Lunch’ included Norman Mailer, Allen Ginsberg, John Ciardi and Paul Hollander.The trial of Naked Lunch was the last significant obscenity trial in American literature. Much fun was had on All Hallow’s Eve at a spooktacular party and staged reading of Dracula: Down for the Count, a comic rendition of the classic horror tale, written by Mary Lynn Dobson, directed by James Herrera. Please check back for more fantastic special events throughout the year! Our Season Kick-Off Gala was a fun-filled evening attended by our sponsors, season ticket holders, Company and Board members, family, friends, and supporters of Mad Horse Theatre Company. Artistic Director Christine Louise Marshall and Board President Laurie Hasty welcomed guests to our home in the historic Hutchins School, and gave a wonderful overview of our plans for the season. Then everyone was treated to staged readings from each of our upcoming main stage shows. Everyone in our Company and on our Board always looks forward to our yearly Season Kick-off Gala! It gives us a chance to relax and talk with others who share our passion for theatre, in general, and for Mad Horse Theatre specifically. Please check back later in the year for the date of our 2015-2016 Season Kick-Off Gala.